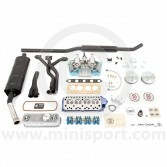 At Mini Sport, our comprehensive range of Mini Tuning Kits includes our notable Twin Carburettor Tuning Kits for Classic Mini, designed to offer over 50% power increase in all Mini models. 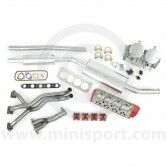 The Mini Sport Twin Carburettor Tuning Kits are available as two custom kits with either a modified Stage 2 cylinder head with Twin ¼ SU carburetor kit or a modified Stage 3 cylinder head with Twin 1/3 SU carburetor kit. 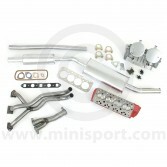 Each kits includes a Mini Sport Superflow exhaust system, Mini Sport alloy water heated inlet manifold, long centre branch exhaust manifold and all gaskets and exhaust fittings. 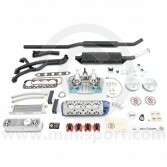 The Mini Sport Twin Carburettor Tuning Kits are recognised as powerful tuning kits, which drastically improve the performance, responsiveness and efficiency of your Classic Mini for an exceptional driving experience. Mini Sport recommend that following a conversion, a trip on the Mini Sport Rolling Road will help diagnose power and correct emissions. Our expert technicians are also able to fit your complete conversion kits in our equipped Service Centre. Browse our complete range of Twin Carburettor Tuning Kits for Classic Mini and please don’t hesitate to get in touch with a member of the helpful Mini Sport team on 01282 778731 or alternatively send an e-mail to sales@minisport.com if you require further advice or information.